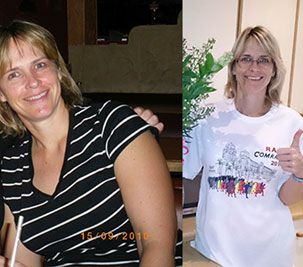 Before I started Banting I was always overweight (from the age of 10 years old despite following a low fat and fat free regime), suffered from terrible hay-fever, blood sugar problems and high cholesterol, poor body image and low self-confidence. Then I heard about it LCHF from Prof Noakes interview on Carte Blanche (M net) in March 2013. I stopped all carbohydrates immediately, and in the next 3 months lost approximately 12kgs. I lost weight from areas that i had never been able to lose from previously like hips and thighs. My running performance improved dramatically and my Cholesterol came down from 6.2 to 4.5. my head was clearer and my hay fever settled. My self-confidence improved dramatically with my new body. I wrote to Prof Noakes to tell him my success story and my testimonial was used in the Book’ The Real Meal Revolution’. a similar article of my success story was also used for the Rand Athletic Club newsletter. What happened next was I ran my best ever Comrades marathon and have managed to maintain my weight loss over the past 3 years. My running continues to improve ( last year i got my personal best times over many distances including Comrades Marathon), my hair is fabulous, my asthma is much better, my eyes and teeth have not deteriorated and i hardly ever suffer from mood fluctuations. My sugar levels remain constant and I never feel hungry anymore. I hardly ever get a cold and if one does start it disappears without the need for antibiotics and lots of medicines. I almost never eat refined foods and sugar. Our fridge is full and our cupboards are empty. And now I am about to run my 6th Consecutive Comrades marathon and am fitter, leaner and stronger than ever before. My cholesterol has maintained at the lower level readings. I have helped so many people to lose weight and get more healthy by setting an example and helping them along the way. My final comment on Banting is that I wish I had known about it from when i was a young teenager. It would have saved me years of being hungry, following low fat and fat free regimes, being bullied at school and low self-confidence. I have never felt so fit and healthy and will continue to follow this way of eating for the rest of my life and will continue to promote it. Thank you Prof Noakes for standing up and risking your reputation to promote a way of life that i personally have seen my family and so many other people benefit from both in health and weight loss areas.